Veterinary Dermatology Services , P.A. was established in 1995. Our offices are located in Golden Valley, Detroit Lakes and Fargo, ND. We understand itchy pets and what it means to live with them. We understand the complications for the whole family that can result from caring for these pets. WE CAN HELP! WE LOVE AND EMPATHIZE WITH YOUR PET. WE SEE HOW MUCH THEIR LIVES CAN IMPROVE WITH THE PROPER THERAPY! WE LOVE TO SEE THEM HEALED! Today’s rapid medical advances make it difficult for any veterinarian to remain current in all subjects. Board certification requires a doctorate degree in veterinary medicine followed by intensive study in a residency program and qualification assessment by rigorous testing to achieve diplomate status. Doctor Globus, DVM, DACVD has practiced veterinary dermatology exclusively for 27 years, which led to experience that cannot be matched by a general practitioner. 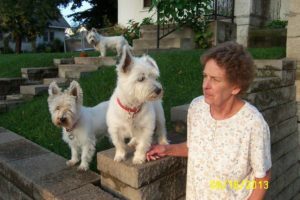 Carol George, CVT worked for several years as a veterinary technician in dermatology at Ohio State University before she began her 22 years she spent with Veterinary Dermatology Service. Tiffany Brown, LVT also had experience in dermatology prior to joining our team in Detroit Lakes. Because most skin conditions are controlled and not cured, we feel it is very important to educate YOU about your pet’s condition and the available options for care. This makes you a part of the decision-making process. We will take time to GET TO KNOW YOU AND YOUR PET, so we can establish a diagnostic and therapeutic plan that works best for your family.